Periods of calm across markets rarely last long and August has a history of turning decidedly ugly for investors. The summer has been distinguished by very supportive central banks, with the Bank of England’s kitchen sink effort in the wake of the Brexit vote just the latest example of the “central bank put” pumping up asset prices. With many central banks still looking to ease policy, one stands apart and holds the key to whether global equities can keep climbing, led by US share prices setting a record pace. In the wake of last week’s robust employment data, the shadow of tighter US Federal Reserve policy and, by extension, that of a firmer dollar remains faint with little prospect of a sharper outline emerging over the coming weeks. For now, complacency reigns, with the US bond market and many investors convinced the Fed will stick to the policy sidelines and keep interest rates low for a long time. Two solid months of job gains in June and July falls into the camp of constituting the best of both worlds for markets. US equities are rising on the idea that second-half activity may gather pace and hopefully ignite earnings growth, while the bond market shrugs off a strong jobs print and continues to expect no action from the Fed. Market expectations of a US interest rate tightening only rise above 50 per cent by March of 2017. The current two-year Treasury note yield of 0.72 per cent remains below last December’s level of 1 per cent, when the Fed finally began tightening policy. Such a belief in the mantra of “lower for forever” against the backdrop of aggressive bond purchases by other central banks has compressed global bond yields and spurred a stampede into emerging market sovereign debt that sport higher fixed returns because they also reflect a greater degree of risk. As measures of market volatility compress ever tighter and the search for yield embraces risqué areas of bond land, investors are largely viewing the world through the lens of secular stagnation. The idea that the US economy will shift into a higher gear and trigger a reappraisal of the dollar with dangerous consequences for elevated EM prices, let alone US assets, notably expensive looking bond proxies — the shares of high dividend paying companies — appears a dim prospect to investors. One can’t blame them for whistling past the graveyard at this juncture, however. The annual gathering of central bankers at Jackson Hole in late August, with a speech from Janet Yellen, will probably offer little new information about the policy outlook. Not until we see the tone of the August jobs data early next month, does the potential beckon for a stronger reaction from investors and the dollar. This is when things might become interesting. Based on employment and inflation considerations, a tightening of US policy from a meagre 0.25 to 0.5 per cent range is warranted. Longview Economics makes the point that two forces — growing wages via a tightening jobs market and accelerating credit and money supply growth — support higher US service sector inflation. “The risks to the consensus view are therefore skewed to the upside, with the growing likelihood that the Fed is forced, at some stage, to once again begin talking up the prospect of rate hikes,” says Chris Watling at Longview. Such talk, however, raises the prospect of a stronger dollar, and as we have often heard, Fed officials do worry about financial market turmoil stemming from a rejuvenated reserve currency tightening financial conditions. At some point and perhaps sooner than the market thinks, US policy officials need to break this impasse. The longer the Fed stays on the sidelines, the more distorted markets become, storing up a much more painful outcome for investors. Big Wall Street banks are asking the U.S. Federal Reserve to grant them an additional five-year grace period to comply with a financial reform regulation known as the Volcker rule, people familiar with the matter said. Those seeking the extension include Goldman Sachs Group Inc (GS.N), Morgan Stanley (MS.N), JPMorgan Chase & Co (JPM.N) and some other banks, the sources said. They are making their push in part through Wall Street lobbying group the Securities Industry and Financial Markets Association (SIFMA). "It's laughable that the biggest, most sophisticated financial firms in the world claim they can't sell the stakes year after year," said Dennis Kelleher, CEO of non-profit Better Markets. "Everyone else in America has to comply with the law and Wall Street should also." The Fed has already granted three one-year extensions for compliance with a broader provision of the Volcker rule regarding stakes in hedge funds and private equity funds – the maximum number of extensions it could provide in that context. The new requests, which were widely expected, concern "illiquid" fund investments. Banks have been selling down non-compliant investments over the last several years, with Goldman having reduced its exposure by more than half since mid-2013. Yet in regulatory filings, banks have said they may face difficulty in getting rid of those investments by upcoming deadlines. And Americans were a frugal people well into the 20th century. But then came the era of instant credit, rampant consumerism and record personal bankruptcies. Nine out of ten US equity funds failed to beat the market over the past year, according to a new study that undermines active managers’ claims that they can outperform in more volatile markets. The semi-annual report on fund manager returns, produced by S&P Global, has long been depressing reading for professional stockpickers, but the scale of the disappointment in the latest figures is likely to fuel further outflows from an industry that is already under pressure. Money has been draining out of actively managed funds and moving into index-tracker funds at an accelerating pace this year. The S&P Indices Versus Active (Spiva) scorecard shows that 90.2 per cent of the actively managed US mutual funds that invest in domestic equities were beaten by their benchmarks, when their returns are calculated net of fees. There was not a single category of domestic fund — whether investing in large-caps, small-caps or a combination, or favouring growth stocks or value stocks — in which more than a quarter of managers succeeded in beating their category benchmark. “There is nothing redeeming to say about the managers in the equity space,” said Aye Soe, global research director at S&P. The latest report covers the 12 months to June 30, which includes the summer 2015 market swoon, the rollercoaster markets of January and February and, after the Brexit vote, the late June sell-off. 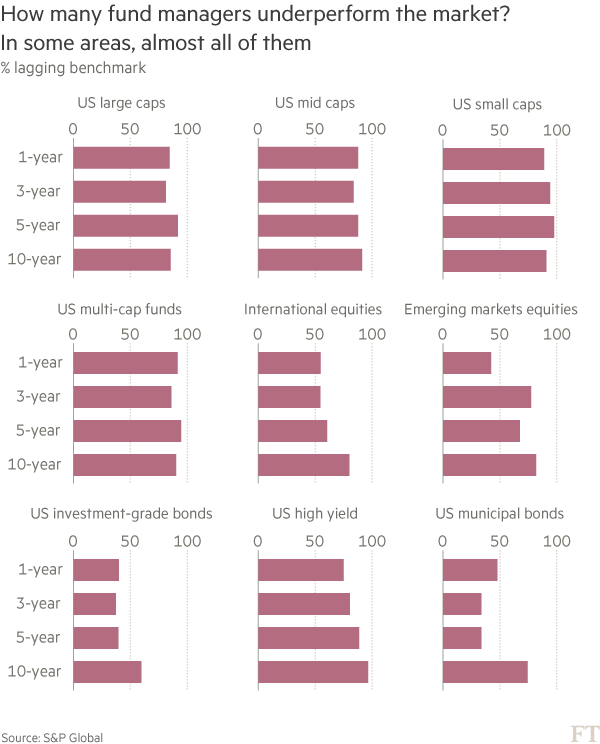 It adds to a 14-year body of S&P data that confirms most US equities managers underperform the index, regardless of the category of fund and regardless of the timeframe. Over the past 10 years, 87.5 per cent of domestic equity funds underperformed. Outside of US equities, however, it includes pockets of positive news. Stockpickers that specialise in emerging markets were more likely than not to beat an EM benchmark in the past year — only 42.2 per cent underperformed — and there were categories of fixed income fund where the average manager beat the index. The best of these were loan funds and municipal debt funds. There is no evidence that the outperformance can be sustained even in those categories, however. On a ten-year view, 81.9 per cent of emerging markets funds and 74.4 per cent of muni funds are below their benchmarks. Some $328 billion flowed out of actively managed mutual funds in the US in the year to July 31, according to Morningstar, while $401 billion flowed into funds that passively track an index, such as those run by Vanguard and BlackRock’s iShares division. The shift has accelerated throughout the year, and July was a record month for outflows from active US equity managers, the research group said. The market share of passive funds has now passed one-third in the US, alarming some industry managers. With fewer investors analysing the value of a company before investing, critics say, the market’s role in efficiently allocating capital is being undermined. “If we push indexing to an extreme no one will get price signals,” said Matt Peron, head of equities at Northern Trust. Executives at asset management companies with large active businesses say they can add value in many markets. Barack Obama is being pressed by the Democratic party’s left wing to sack Mary Jo White, chair of the Securities and Exchange Commission and one of his most senior appointees. In a blistering letter on Friday, Senator Elizabeth Warren called on Mr Obama to use exceptional powers to eject Ms White, accusing her of standing in the way of greater corporate transparency. Her move lays bare dissatisfaction in the party with the head of the market watchdog and Wall Street reform with barely three months remaining of a presidency that began in the throes of the financial crisis. Ms White was confirmed in her role in 2013 and is widely expected to be replaced by an appointee of the next president, as is customary when a new administration takes office. Ms Warren, a Massachusetts senator who has attacked the SEC chair before, accused her of “undermining [the Obama] administration’s priorities and ignoring the SEC’s core mission of investor protection”. She said Ms White had an “anti-disclosure” agenda and zeroed in on her alleged failure to develop a rule mandating the disclosure of political spending by companies — a hot issue since a loosening of restrictions on US campaign finance in 2010. “Chair White’s refusal to move forward on a political spending disclosure rule serves the narrow interests of powerful executives who would prefer to hide their expenditures of company money to advance their own personal ideologies,” she wrote. The senator, — a close ally of Bernie Sanders, the former presidential candidate, is a member of the Democratic leadership in Congress and is likely to take on a more prominent role if Democrats take back control of the chamber in November elections. The SEC is no stranger to criticism. Its alleged lack of vigilance under the George W Bush administration was blamed for contributing to the financial crisis. Those accusations have given way to complaints that it has been too weak in the Obama era. Ms Warren told the president he could use a little-known provision of the law to demote Ms White and replace her with one of the SEC’s other commissioners. When Ms Warren accused Ms White’s SEC of being timid and slow in mid-2015, Ms White hit back by saying the senator had been wrong in her characterisation of her statements and the agency’s accomplishments. Since Ms White was appointed the SEC says it has proposed or adopted more than 50 significant sets of rules. This week it said that in the 12 months to the end of September it had filed a record 868 enforcement actions exposing misconduct by companies and executives. The SEC was created in 1934 to protect investors and consumers, one of the reforms of the Great Depression that followed the 1929 stock market crash. After the last crisis it was asked to implement many Dodd-Frank reforms and ensure regulations were enforced. Even the agency’s most ardent defenders recognise it is not fleet-footed, saying it needs time to grapple with complex issues and adapt to changes in markets in the five years since Dodd-Frank became law. The Federal Reserve signalled that an increase in short-term interest rates is in prospect as soon as its next meeting amid a pick-up in inflation, even as it held rates unchanged on Wednesday. The US central bank kept the target range for its benchmark rate at 0.25 per cent to 0.5 per cent as it avoided stirring up markets just days ahead of the presidential election. But in its post-meeting statement, the central bank reiterated that the case for a rise has “continued to strengthen”, adding that it was now just waiting for “some” further evidence of progress before pulling the trigger. The Fed’s next meeting — its final of the year — is on December 13-14. US stocks extended their losses after the Fed announcement while US Treasuries were little changed. The Fed dropped previous language that predicted inflation would stay low in the near term, saying that it expects a pick-up of price growth after the inflation rate increased somewhat since earlier this year. The Fed has now held rates steady for seven straight meetings as political uncertainty and mixed economic data stay policymakers’ hands. However, a growing contingent of policymakers has been agitating for a second rate increase since December’s rise, fretting that the central bank risks allowing the economy to get too hot and subsequently being forced to tighten more aggressively. By saying in its new statement that it only needed “some” further evidence before lifting rates, the Fed signalled that it was getting closer to lifting. Two members of the Federal Open Market Committee dissented in favour of an immediate increase — regional Fed presidents Esther George of Kansas City and Loretta Mester of Cleveland. Eric Rosengren, who had dissented at the Fed’s last meeting, fell in line with the rest of the committee in opting to hold fire. Traders have long seen a move on Wednesday as unlikely, as they assumed the US central bank will not risk roiling global markets with an unexpected rate increase less than a week ahead of the presidential election. But economic data leading up to this week’s meeting have been solid, with Gross Domestic Product growing at an annualised 2.9 per cent pace in the third quarter and monthly payroll employment growth averaging 178,000 so far this year. Janet Yellen, the Fed chair, argued in September that the labour market recovery had further room to run as she justified the central bank’s decision not to tighten policy, but she suggested a move was not a long way off. Even if the Fed does lift rates in December, it would still represent a glacial pace of tightening compared with previous recoveries. In December of last year policymakers were predicting four upward moves in 2016. Markets now expect a single, quarter-point rise in December. According to CME Group data before Wednesday’s decision, traders were putting the chances of a December increase at just under 70 per cent. A key risk ahead is the US election. 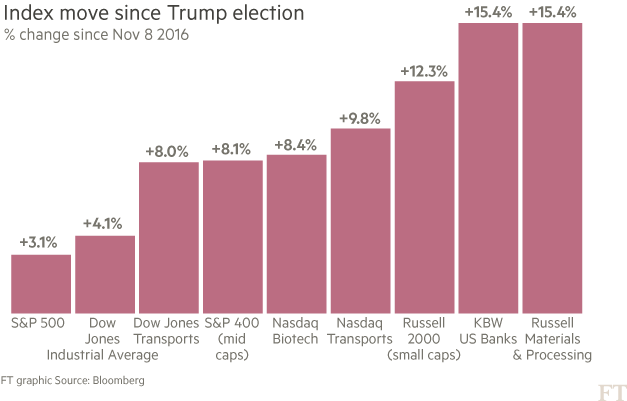 If Donald Trump were to win next week, academic research suggests the victory could trigger a sell-off in financial markets. That would create fresh uncertainty as to the timing of the Fed’s next move. The U.S. markets are largely following the probabilities of a Trump victory- Trump's chances rise, and the market falls. If Trump wins, we'll see a near market crash the next day. A more likely scenario is a contested election result, with Hillary narrowly winning the popular vote while Trump wins or is close to winning the electoral college. That's leave us with years of legal challenges to the election and no confidence in whoever manages to wrangle access to the White House on January 20th. Then again, Trump has already hinted he wouldn't live in the White House... Maybe he's going to move to Trump Hotel DC and claim to be president, even if he loses? Glad I'm mostly in foreign markets, international companies, and cash! A market crash represents one of the rare bargain buying opportunities in stocks for the common person. I'm already prepared for such an eventuality. Yup, time to convert more stocks to cash so I can go on a buying spree when the market bottoms. American Axle announced they're purchasing Metaldyne today, provided me good opportunity to liquidate Metaldyne at a profit. Sounds good. I remain neutral on AXL. Far better ways to invest money. The stock of Navistar International hit a new 52-week high and has $36.47 target or 51.00% above today’s $24.15 share price. The 5 months bullish chart indicates low risk for the $2.00B company. The 1-year high was reported on Nov, 7. About 111,447 shares traded hands. If the $36.47 price target is reached, the company will be worth $1.02 billion more. The 52-week high event reflects very positive momentum. NAV has risen 99.74% since April 5, 2016 and is uptrending. It has outperformed the S&P by 97.79 percent. Few remedies for the economy have a high probability of making it through a divided government. The next president will have less effect on the U.S. economy than the bevy of powerful, persistent forces that are slowing the nation’s growth. Demographics will be the largest drag, but high global debt loads, slowing innovation, China’s secular slowing and other central banks’ actions are all headwinds. Slow growth makes monetary policy more difficult to execute, leaving policymakers with few tools to spur growth. Few remedies for the economy have a high probability of making it through a divided government. To a degree, this should limit the reach and extent of further damage to the economy. But proper governance would be more effective in counteracting the pressures the U.S. economy will feel in the coming years than simply additional monetary policy pressures. Simply stated, it does not matter who sits in the Oval Office. Spurring growth will be a treacherous undertaking, especially as the Fed tightens policy. Recently the global growth story has revolved around China’s rapid growth and voracious appetite for commodities. China contributes nearly a third of the comparable (by purchasing power parity) growth to the global economy. That is a stunning figure. More than simply driving its own economy, China’s incredible emergence has lifted the commodity-producing nations of the world, many of which were smaller, emerging nations that required better infrastructure in the form of ports, bridges, roads and electrical grids in order to meet the voracious new demand. It was an incredibly fortuitous positive feedback loop. When China stopped buying, much of the emerging world stopped growing. Granted, China is attempting to soften the blow. Its “One Belt, One Road” initiative to build out trading lanes in Asia and elsewhere could provide an eventual boost to those economies affected most by China’s slowdown. But this attempt to assuage the impact will take years to prove effective, if it does at all. And in its wake, China leaves the global economy searching for its next great growth story. The problem? There may not be one on the horizon. What does this mean for the Fed? A slower-growing China and emerging markets makes it more difficult to spur growth at home. And because they are not growing as quickly, there is far less pressure on prices—especially commodities. Lower growth and lower inflation pressures are not conducive to raising rates. The Fed knows it will be fighting this battle for years to come. If the United States were a “closed” economy, there is a good chance interest rates would be higher. While this is fine as a thought experiment, it is ineffective for policy design or debate given the hyper-globalized reality that is the new normal. The United States is an ultra-open economy with the dominant currency in trade and finance. This means that even small differentials in monetary policy between itself and other countries will have a significant spillover effect. Policy makers at the Fed must not only deal with the economic realities facing the United States, but with the extraordinary policies emanating from other central banks. The principal offenders are the Bank of Japan, the European Central Bank and the People’s Bank of China; there is no end to it in sight. The Bank of Japan has announced it will maintain its ten-year yield at 0 percent for the near future, the European Central Bank is likely to extend its quantitative easing, and the People’s Bank of China is slowly and steadily depreciating the Chinese yuan. In their own ways, each of the other major central banks is making it more difficult for the Fed to raise interest rates. This is because each of the other major central banks is making the dollar stronger. A stronger dollar causes the U.S. economy to slow and inflation pressures to decline. The essence of the problem is that the United States loses growth and inflation, not because of something endemic to the U.S. economy, but because the U.S. dollar strengthens—a feedback loop that is difficult to break. While it hurts the United States to be tightening during extreme easing elsewhere, it benefits others. Without the Fed’s relative policy tightness, European Central Bank president Mario Draghi’s stimulus program would not be as successful and neither would the stimulus currently underway in Japan. China, by allowing its currency to weaken, regains some competitiveness in exporting goods. This is part of the Fed’s dilemma. The U.S. economy has proven to be far more resilient than other developed countries. The United States avoided a multi-dip recession following the Great Recession, something Europe cannot claim to have done, and a hypervigilant Fed should receive some credit. This resilience should be a blessing, but, in many ways, a stronger dollar and the resulting lack of monetary policy leeway diminish many of the advantages. The problem is that the Fed has not been particularly accurate in predicting how quickly it will raise rates. When the Fed forecasts a specific number of hikes, financial markets (at least initially) anticipate the moves. This means that even before the Fed announces a rate hike, the market has pushed interest rates and the U.S. dollar higher. It is this premature tightening that has befuddled and aggravated the Fed. It causes U.S. growth to slow, and forces the Fed to back down from stated plans. It damages credibility and threatens to dictate policy. The Fed’s reluctance to admit how much the first two factors (China’s slowdown and the easing of other central banks) affect policy is largely responsible for this final piece, and may be the most important since the Fed will rely far more on confidence and credibility to conduct monetary policy in the future. Regardless of who takes the White House, these problems are not going away. Monetary policy will struggle because global growth has disappeared, because central banks are reacting to it and because the Fed misunderstood the difficulties of executing policy in this environment—not, as some would argue, because of partisan politics. The election of Donald Trump as US president will unleash a policy shift away from monetary policy towards fiscal measures in the coming months, some of his advisers told the Financial Times. In particular, some members of his economic advisory team are convinced that central banks such as the US Federal Reserve have exhausted their use of super-loose monetary policy. Instead, in the coming months they hope to announce a wave of measures such as infrastructure spending, tax reform and deregulation to boost growth — and combat years of economic stagnation. Mr Trump’s campaign rhetoric has fuelled concerns about the future of Janet Yellen (age 70), chair of the Federal Reserve, who faced unprecedented levels of criticism by the candidate during the campaign. Hours after the Republican stunned global markets by defeating Hillary Clinton, Judy Shelton, a member of Mr Trump’s advisory team, told the Financial Times that the US central bank had created a “false economy”. She reiterated that Mr Trump wanted to see someone at the helm of the Fed whose thinking was more in line with his. Thomas Barrack, chief of Colony Capital and an adviser to Mr Trump, sought to quell fears in the markets that Mr Trump would act precipitously on Fed policy, stressing that a President Trump would be a very different man than “candidate Trump”. Mr Trump’s victory will cast fresh uncertainty over Fed policy after the central bank signalled that a rate rise looms in December. Some economists argued on Wednesday that the Fed may well press ahead with a quarter-point move in the absence of a violent market reaction to the election. Mrs Yellen’s term is not due to expire until 2018, but the election of a man who has been so critical of her during the campaign has triggered speculation about her future. Mr Trump has claimed Mrs Yellen was acting at the behest of the Obama administration in leaving rates low, but he cannot fire the Fed chair outright and she is not expected to leave before the end of her term. However, Mr Trump may have the opportunity to inject a more hawkish bent to policy by moving to fill two vacant positions on the Fed board in 2017. She did not offer specifics on the kinds of reforms Mr Trump would seek, but Ms Shelton is an economist and co-director of the Sound Money Project which has been campaigning for a hawkish monetary policy for a long time. Mr Barrack said Mr Trump would move “very slowly” when it came to central bank changes and allow policymakers to be independent in their decision-making, because the president-elect understood that this was a “delicate and dangerous place to be”. However, he stressed the view that something other than central bank intervention was now needed to take over as the driver of the economy, pointing instead to fiscal policy and infrastructure spending in particular. Public debt was currently low as a share of GDP in the US, he said, pointing to public-private partnerships as a way of enticing investment just as it does in other parts of the world. Mr Trump repeatedly argued during the campaign that the US had underinvested in its roads and ports and pledged to exceed the infrastructure plans being mooted by Mrs Clinton. During last week's excitement, Navistar (NAV) set a new 52-week high of $27.36. Oshkosh (OSK) set a new 52-week high of $65.76. Paccar (PCAR), which set its 52-week high of $60.86 on April 27, reached $60.41. Update; NAV set a new 52-week high of $27.48 on Monday, Nov 14. Is the U.S. heavy truck sales slump over? The following graph shows heavy truck sales since 1967 using data from the BEA. The dashed line is the October 2016 seasonally adjusted annual sales rate (SAAR). 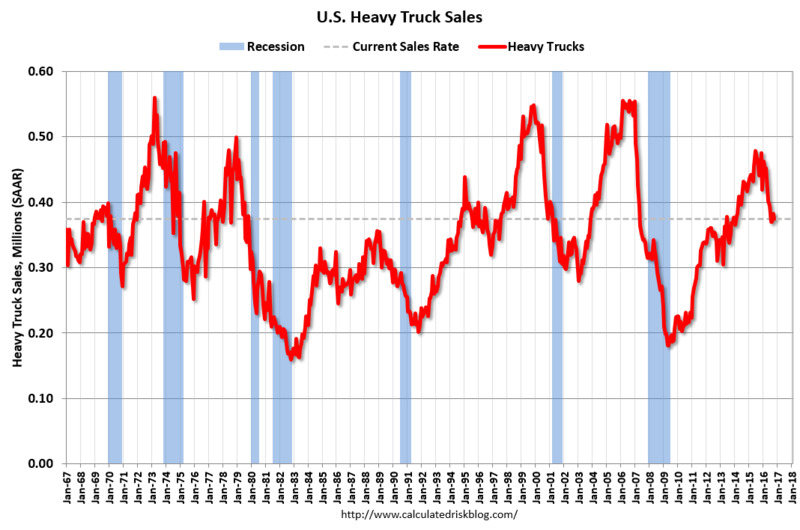 Heavy truck sales really collapsed during the recession, falling to a low of 181 thousand in April and May 2009, on a seasonally adjusted annual rate basis (SAAR). Then sales increased more than 2 1/2 times, and hit 479 thousand SAAR in June 2015. Heavy truck sales have since declined again - probably mostly due to the weakness in the oil sector - and were at 374 thousand SAAR in October. Even with the recent oil related decline, heavy truck sales are at about the average (and median) of the last 20 years. Sales have been at about the same level for four consecutive months. It is possible the oil related slump in heavy truck sales is over. US bank JP Morgan Chase is to pay $264 million (£212m) for hiring the children of highly placed Chinese communist officials to gain business in China, in violation of the Foreign Corrupt Practices Act. The Department of Justice called the scheme "bribery by any other name" and said it threatened national security. The Securities and Exchange Commission (SEC) and Department of Justice began an investigation in 2013. The bank will pay the SEC $130 million for violations under the Foreign Corrupt Practices Act. It is also expected to pay $72 million to the Department of Justice and $61.9 millio to the Federal Reserve Board of Governors. JP Morgan purposely hired otherwise unqualified candidates for prestigious investment banking jobs solely because they were introduced to the bank by officials who could give it business. Job candidates were hired on the understanding that the job was linked to the award of specific business, amounting to corruption. The SEC said that over seven years, about 100 interns and full-time employees were hired at the request of foreign government officials, enabling JP Morgan to win or retain business that generated more than $100 million in revenues. It said: "JP Morgan employees knew the firm was potentially violating the [Foreign Corrupt Practices Act], yet persisted with the improper hiring program because the business rewards and new deals were deemed too lucrative." The SEC’s Kara Brockmeyer said the misconduct was "so blatant that JP Morgan investment bankers created 'referral hires vs revenue' spreadsheets" to track the money flow. The DoJ's William Sweeney said: "When foreign officials are among those involved in the bribe, the international free market system and our national security are among the major threats we face." As we mentioned in this week’s newsletter, the market is getting dangerously ahead of itself. Navistar (NAV) reached a high of $31.29 on Wednesday, closing at $31.07. Oshkosh (OSK) virtually reached the $70 level, with a high today of $69.97, closing at $69.93. Paccar (PCAR) reached a high of $62.22, closing at $61.98. We account the market’s significant and rapid advance to a combination of irrational exuberance AND unknown market forces that should be feared. We fully expect insiders to take profits from this market advance, and fear a future drop, as there is little rational underlying support for the S & P’s current record high level. Closing at record highs for three consecutive days, the S & P closed at 2,204.72 on Wednesday. Note: BMT Investors COO Barry Holden announced this week that we have again secured the BlackRock property within the Ocean Reef Club on Key Largo from our investment partner for our winter retreat. BMT Investor members will receive further details over the coming weeks. As Wall Street traders departed for Thanksgiving this week, they could celebrate a rare achievement. On Monday and Tuesday, the four most widely cited indices of US stocks — the S&P 500, the Dow Jones Industrial Average, the Nasdaq Composite and the Russell 2000 — hit all-time highs simultaneously. The last time a “grand slam” happened was on New Year’s Eve 1999, at the height of the tech bubble. The breakthrough for stocks, which had moved sideways for two years since the Federal Reserve stopped its quantitative easing program, seemed to confirm a regime change. Prompted by Donald Trump’s victory in the presidential election, the narrative has changed to preparing for an era of tax cuts, deregulation and fiscal stimulus, after eight years of markets being guided by the Fed’s historically low interest rates. “My sense is that investors are exuberant to have a new theme, any theme, other than watching the Federal Reserve,” says John Hussman, a fund manager. This fresh exuberance has prompted a shift from bonds to stocks. About $500bn had gushed from equity funds and into bonds this year but last week the flows reversed, with investors yanking more than $18bn from fixed-income vehicles and pouring $27.5bn into stocks. And the financial media are already discussing when the Dow Industrials will reach 20,000 — almost 18 years after the index first passed 10,000. * Keynesian economics are the various theories about how in the short run, and especially during recessions, economic output is strongly influenced by aggregate demand (total spending in the economy). Wall Streeters tend to be sceptical of Keynesianism, but are excited that Mr Trump could “out-Keynes Keynes” with Democrats in Congress supporting his infrastructure plans over the objections of small-government conservatives. Hopes are high for deregulation, in sectors from banking through healthcare to mining and energy. Bond investors have taken note. Ten-year US Treasury yields hit a postwar low in July, then started to nudge higher ahead of the election, and have shot up to 2.4 per cent this week. Many analysts think that the three-decade bond bull run is now over. Futures markets signal certainty that the Fed will raise rates next month, normally bad news for stocks. But the tectonic shifts had started in the US equity markets in the summer, in readiness for a new regime. In the QE period, the stock market was dominated by “bond surrogate” stocks that pay a reliably high dividend yield and by shares that were economically defensive. Cyclical stocks were out of favour, as were financials. But in midsummer, these trends began to turn, and after the election these out-of-favour stocks received a huge boost. David Donabedian, chief investment officer at Atlantic Trust, noted that as soon as the election results were clear, the Trump team put out a pro-growth economic message. “Coming right out of the block in the first 12 hours they hit all the right notes: the need to boost economic growth, the need for corporate tax reform, the importance of boosting infrastructure spending,” he says. That turned a fear of a visceral sell-off into an environment where “animal spirits” were restored — and upward momentum took hold. The shift left clear winners and losers in its wake. Banks are the biggest victors, with investors hoping that Mr Trump will repeal parts of the post-crisis Dodd-Frank legislation. The KBW index of big US banks is up 15.4 per cent since election night. Even if Wall Street regulations are not relaxed as much as the banks hope, rising bond yields should still boost their profit margins. Among other prominent winners are healthcare stocks, which have shown relief that the threat of price controls under a Clinton administration has been lifted. Oil and mining companies have also enjoyed a rally thanks to the Trump administration’s likely change of emphasis on the environment. Plenty of dangers lie ahead. One obvious risk to the “Trumpflation” rally is that a strengthening dollar — it is now its highest since 2003, having rallied 43 per cent since the global financial crisis — will choke off the profits of large companies and damage exporters. Wage growth will also crimp profits. Higher bond yields could spell trouble for equities by drawing investors back to fixed income. They could also raise companies’ borrowing costs and make debt-financed share buybacks less attractive. “At some point this isn’t going to help equities,” says Michael Roberge, chief investment officer at MFS, an asset manager. There is also the possibility, as happened during the last period when the four main indices set records together in the late 1990s, that the market reaches a heady stage and “melts up” — a process that could last a year or two but would set it up for a 2000-style crash. Stocks already look more expensive than they did at their peak before the 2007 crisis. Another risk is that Mr Trump fails to stimulate the economy as hoped. After all, he must deal with a Republican majority in Congress that in 2011 threatened to default on Treasury debt rather than allow any increase in federal borrowing. And there is overwhelming dislike on Wall Street for Mr Trump’s protectionist policies, such as ending the North American Free Trade Agreement (NAFTA) and imposing tariffs on China. Any such policies, which might have opposition from pro-business Republicans but support from rust-belt Democrats, are viewed as unambiguously negative for the rest of the world. Stocks outside the US are down since the election, most severely in emerging markets, showing that markets regard a new protectionism as a real possibility. There are fears that tariffs would slow down the US economy and stoke inflation in the longer term. Another risk is that the sheer divisiveness of the political landscape could drive sharp market swings. Tom Porcelli, chief economist of RBC, polled clients and found that “people were having a hard time separating their economic/market view from their political view”. Emotions will probably run high, bringing volatility in their wake, as Mr Trump rolls out an agenda. Navistar International Corp. announced plans Jan. 12 to issue, subject to market conditions, $200 million of its 8.25% senior notes due 2021. The latest offering is for additional notes under a previous indenture for $1.3 billion, of which $1.2 billion remains outstanding, Navistar said. The company said it expects to use the net proceeds of the offering for general corporate purposes, including working capital and capital expenditures. Yellen added that she expects the US central bank to tighten monetary policy a few times a year until 2019. But on the cusp of Donald Trump’s inauguration as an economy-focused president, she also said slow productivity growth meant the US’s “usual” rate of economic expansion would be “significantly slower than the post-world war two average”. Trump will inherit an economy in much stronger shape than the one left to President Obama, with Yellen noting in a speech that the US is close to maximum employment and that inflation is moving towards the Fed’s 2 percent target. Delaying could force the Fed to catch up by raising rates rapidly, she said, which could in turn push the economy into a new recession. Longer-term, she said that while economists did not fully understand the causes of a slowdown in US productivity growth, the trend implied lower-than-average growth and a neutral interest rate of 3 per cent — a full percentage point lower than the Fed’s estimate three years ago. The U.S. economy continued to expand modestly from late November through the end of 2016 as a tightening labor market helped lift wages and prices more broadly, a Federal Reserve survey showed. The central bank’s Beige Book economic report, based on information collected by regional Fed banks on or before Jan. 9, said firms and industries were optimistic about growth this year. Employment gains were characterized as slight to moderate, with most of the Fed’s 12 districts saying they expected the labor market to continue tightening. The report underscores the U.S. central bank’s views that the economy is healthy enough to continue removing monetary stimulus. Fed officials raised their benchmark interest rate by a quarter percentage point Dec. 14, to 0.5% to 0.75%. They also increased the number of hikes they anticipate in 2017, to three from two, based on the median projection of 17 members of the Federal Open Market Committee. The Fed’s outlook for the economy is clouded, however, by uncertainty surrounding the fiscal policies of the incoming administration. While he promised spending increases and tax cuts in his campaign, President-elect Donald Trump has provided few details since the Nov. 8 election on the concrete policy proposals he intends to bring to Congress. Some Fed districts reported a rebound in confidence after the election, though the Cleveland Fed noted that it’s unclear how changes in regulations will impact investments. The Fed also noted that pricing pressure has intensified, with eight districts reporting modest inflation. The Fed’s preferred measure of inflation, excluding food and energy, reached 1.6% in the 12 months through November. Average hourly earnings rose 2.9% in December from a year earlier, the biggest jump since 2009, adding to confidence that inflation will continue to edge toward the Fed’s 2% target. NAV reached a high of $30.28 on Wednesday, and closed at $29.91. OSK reached $73.71 on Wednesday, establishing a new 52-week high, and closed at $73.11. PCAR reached a high of $68.69 on Wednesday, and closed at $68.40. 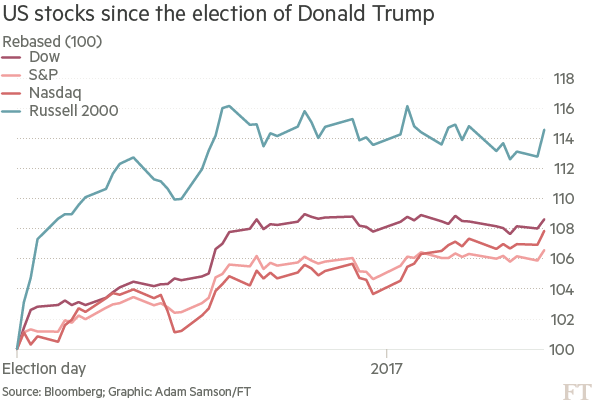 Donald Trump’s early moves on infrastructure and deregulation have reignited investor confidence in the US economy, propelling stocks into record territory and sending the Dow Jones Industrial Average to close above 20,000 for the first time. Mr Trump was quick to note the milestone for the blue-chip average, tweeting “Great!” with the hashtag “#Dow20K”. But bullish sentiment was not isolated to the Dow, an idiosyncratic index which tracks just 30 popular stocks whose performance is driven by companies with the highest share prices. The broader S&P 500 benchmark also hit new highs, helped by rallies in economically-sensitive sectors directly affected by Mr Trump’s first executive actions, including requiring that domestic steel be used for US pipelines and building a wall along the Mexican border. Investors have poured money into shares of banks and other cyclical companies on hopes that a mix of tax cuts and fiscal stimulus from the Trump administration will accelerate economic growth and inflation. ‘’With a swift move towards signing executive orders, coupled with underlying positive economic data, clarity has begun to hit the headlines, and all the US indexes are celebrating,” said Quincy Krosby, market strategist at Prudential Financial. After a strong post-election rally late last year, the Dow spent more than a month stalled just below 20,000 as investors awaited greater clarity on Mr Trump’s policies. When it passed the threshold, “a loud roar” was heard on the NYSE floor, its governor Rich Barry said. Traders pulled out Dow 20,000 caps they have had ready since about a week after the election, he said. At the close of trading in New York, the Dow was up 0.8 per cent at 20,068.5, while the S&P 500 closed up 0.8 per cent at a record high of 2,298.4. The Russell 2000 index of small, domestically orientated companies rose 1 per cent, but remains just shy of its record close set in December. Since the election, the Russell has gained 15.7 per cent. Launched in 1896, the Dow has surged 9.5 per cent since Mr Trump’s November victory. As a price-weighted average, the Dow has been catapulted higher by strong gains in those member companies with the sharpest share-price movements. Goldman Sachs has accounted for 379 points of the Dow’s 1,736-point march higher since election day as its shares have climbed 30.4 per cent. Boeing, the aerospace group, has contributed 172 points and IT company IBM 158 points. The S&P 500, a benchmark created after the Dow and based on market capitalisation, is far more important to professional investors since it captures a broader cross-section of corporate America. It has trailed the Dow’s gains, rising 7.4 per cent since election day. While the Dow’s march to 20,000 has captured attention, the “degree to which markets can manage to retain their collective stability and constructive trends” is of far more importance, said Peter Kenny, senior market strategist at Global Markets Advisory Group. The Trump administration’s plans to boost infrastructure spending, pare regulations and rethink America’s trade posture have lifted expectations for both inflation and economic growth, boosting the shares of miners this year. MSCI’s ACWI Metals & Mining index, a broad barometer tracking global miners, has rallied nearly 15 per cent in 2017, its strongest year-to-date showing in more than a decade, Bloomberg data show. Miners listed on London’s FTSE 100 have registered gains in the region of 20 per cent this month. Freeport-McMoRan, the large US copper miner, has risen by a quarter since the end of the year. “The reflationary trade of last year and earlier this month has now moved to more of a legitimate inflationary trade, and that is why you have seen a bid for gold and other things that are inflation protection-type investments,” said Michael Underhill, a portfolio manager at RidgeWorth Investments. The US central bank has raised short-term interest rates for only the third time since the financial crisis, stepping up the pace of tightening as policymakers grow increasingly confident that America’s enduring recovery will lift inflation. The Federal Reserve raised the target range for the federal funds rate to 0.75 per cent to 1 per cent, in a move that has come earlier than markets were expecting as recently as last month. Fed policymakers stuck with previous median projections that there will be a total of three increases in rates this year, defying predictions from some analysts that it would release a more aggressive set of rate-raising forecasts. One rate-setter — Neel Kashkari of the Minneapolis Fed — dissented from the vote for a rise, arguing in favour of unchanged rates. In new language, the Fed’s statement also stressed that its inflation target is symmetric, in an acknowledgment that price growth could surpass its 2 per cent target without forcing the central bank to clamp down precipitately. Treasury yields dived and the US dollar came under pressure immediately after the statement. The yield on the 10-year Treasury note, which moves inversely to price, fell by as much as 10.7 basis points to 2.5 per cent, its biggest intraday drop since November 9, the day after the US election. The 2-year yield was down 7.9 basis point to 1.297 per cent. The dollar index, which gauges the buck against a basket of half a dozen peers, was down by 1.1 per cent, as expectations of four rate rises were dashed. Federal funds futures pinned the probability of four or more increases at 18.9 per cent at midday on Wednesday, down from 24.5 per cent on Tuesday, according to Bloomberg data. Odds of a June rate rise also retreated to 47 per cent, down from around 60 per cent on Tuesday. Janet Yellen, the Fed chair, signalled in Chicago this month that the Federal Open Market Committee thought monetary policy has hit a turning point that would require rate rises to come more frequently than the once-a-year pace set in 2015 and 2016. In a press conference, Ms Yellen suggested that the Fed’s economic and policy outlook had not changed substantially since December and emphasized that she was not going to rush to judgment about the impact of changes to tax and spending policy by Congress. While some analysts expect looser fiscal policy to boost the US economy next year, Ms Yellen said “we have plenty of time to see what happens”. Among the factors that are underpinning the Fed’s confidence are employment and inflation data that are approaching its targets, a reduction for the time being in perceived risks overseas, and an ebullient mood in stock markets. In its post-meeting statement, the US central bank signalled it was getting more confident about inflation, noting that headline price growth has moved close to its 2 per cent objective, even if its favoured measure of core inflation remains lower. Highlighting “solid” job gains, the Fed’s statement also underscored an improvement in business investment compared with previous meetings. The risks to the outlook remain “roughly balanced” it said, mirroring recent language. However, as Fed officials’ economic forecasts showed, the Fed has by no means ditched its cautious approach to monetary normalisation, with its post-meeting statement reiterating guidance that further rate increases will be gradual. The so-called dot plot projections pointed to a quicker pace of tightening than the once-a-year speed set over the past two years, but the Fed forecasts remain shy of predictions by some forecasters that there could be four increases this year. The median interest rate projection for the end of 2017 was centred at 1.375 per cent — unchanged from December’s outlook. The forecast was centred at 2.125 per cent in 2018, also the same as December’s prediction, and at 3 per cent in 2019, a shade higher than before. The median projection for the long-run rate remained at 3 per cent. Fed policymakers’ forecasts for growth and inflation remained little changed, with growth tipped to be 2.1 per cent this year and next year, slipping to 1.9 per cent in 2019. Core inflation is set to be 1.9 per cent in 2017 and 2 per cent in the two following years. The possibility of looser fiscal policy emerging from Congress has triggered speculation that the central bank will have to further accelerate its rate-rising campaign, but a number of policymakers are insistent that they want to see firmer plans emerging from Congress before making a call on the impact of possible tax cuts on the economy. In her Chicago speech, Ms Yellen did not dwell on fiscal policy as she made the case for higher rates. Also looming on the horizon is also the question of when and how to start reducing the size of the Fed’s $4.5tn balance sheet. The Fed’s stockpile of assets is a legacy of the financial crisis interventions that a growing number of policymakers have said now needs to be discussed. In its statement, the Fed reiterated that it anticipates holding its balance sheet unchanged until normalisation of official rates is “well under way”.